Slava Makarov: We’re not announcing the new mechanics for the IS-4 branch just yet. Yes, we came up with some very cool things. I don’t want to spoil the surprise. It will be one of the “first victims” of the new mechanics for the Soviets. S: There is a desire to get to the UK tech tree, and make it a bit more original. S: It’s not that some machines are stronger or weaker than the tank, the problem was that the tank changed quite a bit, and predictably. Nearly swore to our designers, who believed that the changes would not be big; the machines just started to make their way to other places. Such things can’t be rolled out without telling the players, a very large number of tanks have changed. The changes regarding the penetration and overmatch mechanics have been frozen for major internal testing. 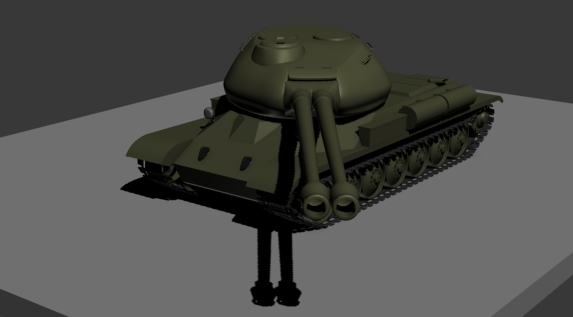 S / Murazor / Anton Pankov: KV-5, what we’re going to do with this has moved from patch to the patch for 6 months, and we haven’t yet reached an acceptable solution. Gold round spam in this tank is the same as that of the rest of the 8s. There’s some high statistics in the KV-5. We looked through them 20 times for each level of the players. M: Panther / M10, Japanese Tiger aren’t too far in the queue (most likely regarding the changes to premium tanks). A: We have to develop a feature, separate from the current recovery feature. It won’t be free, of course, but not at full price of a tank. Maybe we can return prem tanks sold 3-4 years ago. M: The KV-85 at Tier 6. We may change the 122mm gun sooner or later. Make it so that it is more comfortable to play, as it’s simply impossible now. In addition to the above, other goals discussed for the next year are things such as continuing their map remodeling and making the eSports elements of World of Tanks more accessable to the general playerbase. Such things as smaller scale local tournaments and formats more in-line with what players are familiar with from Random Battles. I didn’t know anything about this IS-4 branch changes: any hint besides what it’s stated in the news? They recently said that they want to change and redesign the role of the ST-I when they’ll make the HD model. More info on this please … it will take some time for sure but it would be interesting still. How do they know? They simply refuse to even try reducing the rng. I think what they mean to say is RNG makes really bad players able to hit or bounce/dodge shots simply because of luck. Removing this tomato crutch will most likely reduce the player base as those casual “play for fun” idiots are no longer able to rely on their RNG armour to save them and the hand of Stalin to guide their shots. What WG fail to realise is most of the “play for fun” players that rely heavily on RNGesus are not paying customers and with servers (at least EU and RU) well populated we can afford to loose some of the cannon fodder to get a less frustrating game. http://i.imgur.com/y8prUNq.jpg i believe this is what your referring to. Thought about It too.. what if the is4 becomes another tier VIII prem and ST-II Will be the tier X? I doubt they will gimp it. More likely a split in the branch that makes a bit more since in the Tech Tree. Maybe a break from the KV-4 to the ST-I then to the ST-II? Then ya just need to find a good fill for the Tier IX then IS-4 at Tier X. Or drop the IS-4 to Tier IX and add a new Tier X? But that could become a larger headache then it needs to be. Yes, give me back my tier IX IS-4! With the IS-7 gun again please. Then let it face tier V tanks again. What is ‘gimp it’ please?? While I don’t deny the 122 on the kv85 can be difficult, I got my ace in it with the 122mm…. I had that from KV3 and didn’t have 100mm yet. It is. It seems to be a bunch of answers to questions which were never asked. Some context would be helpful. I regret having sold the gift tank Te-Ke, but it was not offered again in any form. No matter what WG may claim, +/- 25% is hurtful for player enjoyment – 15% would be a nicer number. Why does 122 even have to be in t6? It’s not fun for t5 players to be oneshot. Also while 25% is fun sometimes it’s more often than not just frustrating imo. lets make esport with 25% rng, …. ,typical russian way of fairplay, we all know who gets +25% and who gets -25%.